Lou’s guest appearance with Christine, Key of C on Atlanta Life Radio has been rescheduled due to storms in the Atlanta area taking out Internet service. 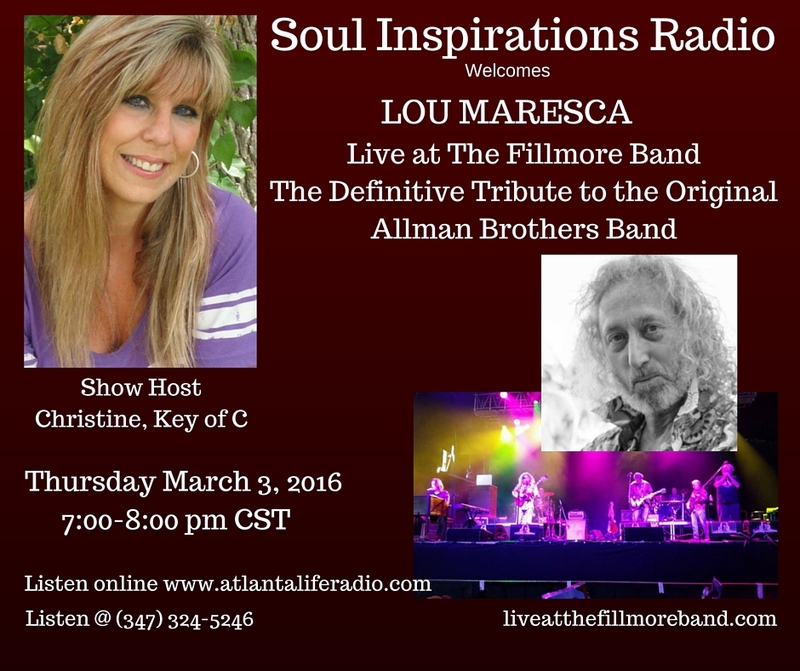 Lou will be joining Christine on Soul Inspirations Radio on Thursday, March 24th from 7:00-8:00pm CST. LIVE AT THE FILLMORE, the world’s #1 tribute to the Allman Brothers Band comes to The Egg Center for the Performing Arts for its first appearance in Albany, NY on Saturday, January 23rd at The Egg Center for the Performing Arts! LIVE AT THE FILLMORE appears for the first time at FM Kirby Center in Wilkes-Barre, PA! LIVE AT THE FILLMORE, the world’s #1 tribute to the Allman Brothers Band returns for its 3rd appearance at Variety Playhouse on Saturday, January 9th at 8pm. Last time LATF performed at Variety Playhouse it was a near sell out so buy your tickets early this time! LIVE AT THE FILLMORE returns to The Hamilton LIve, Washington, D.C.! LIVE AT THE FILLMORE, the world’s #1 tribute to the Allman Brothers Band returns to The Hamilton Live in Washington, D.C. on Monday, December 28th at 7:30pm! LIVE AT THE FILLMORE comes to The Fillmore Philadelphia! 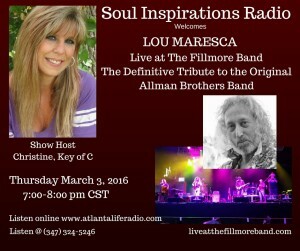 Have you been hearing a lot about LIVE AT THE FILLMORE™, The Definitive Tribute to the Original Allman Brothers Band? How about the amazing new live venue, The Fillmore Philadelphia? Check out both this Sunday, December 27th, when LIVE AT THE FILLMORE comes to The Foundry at Fillmore Philadelphia at 8pm!